Location: Aparthotel Saint George Palace is an elegant 4-star apartment complex located in Bansko at the foot of Pirin Mountain, on the border with Pirin National Park, about 800 meters from the ski lift and three kilometers from the town center. 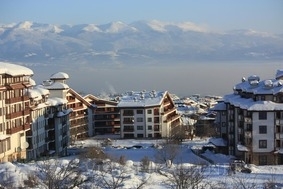 It has the highest position in Bansko, so it offers a unique view of three mountains. The complex operates year-round and is an excellent choice for families, groups of friends, team building and corporate events. Accommodation: The hotel offers 150 fully equipped apartments and studios. Accommodation at the aparthotel offers self-catering and laundry facilities. Each guest room features a kitchenette, a spacious seating area and a flat-screen TV with satellite channels. The bathrooms are fitted with toiletries. Cooking facilities are available for an extra fee. Bars & restaurants: The hotel's restaurant serves traditional Bulgarian, Italian and European dishes prepared with fresh seasonal products. The aparthotel also offers 2 bars: a sports bar with billiards table and a panoramic bar overlooking the mountain. The relax zone, which guests can use for free, consists of a large indoor swimming pool with a panoramic glass roof, a hot tub, a sauna, a steam bath, a modern fitness center and massage / treatment rooms. During the winter season, free transfer to the first station of the cabin lift is provided.